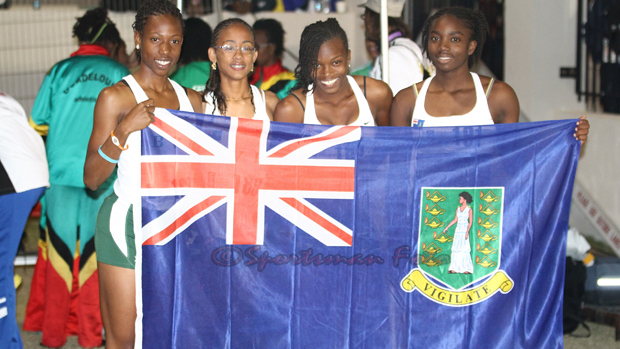 BERMUDA, APRIL 9— Lakeisha “Mimi” Warner and the U17 Girls 4x100m Relay team—coupled with Trevia Gumbs’ Shot Put silver during the morning session—brought the territory’s medal count to a record five at the end of day two in the 41st LIME Carifta Games, which wraps up today at the National Stadium in Devonshire, Bermuda. The three medals in one day is a record and matched the 2006 and 2007 overall totals, bringing the BVI’s haul to 25 since 1978. A year ago, Warner had a meltdown in the Carifta Games U17 Girls 800m final. Last night, the 2014 Youth Olympic Games hopeful ran a masterful race, strategically weaved out of traffic and challenged the Jamaicans for the top of the pile—but came up .11 seconds short—to claim the bronze medal. Warner had a time of 2 minutes, 18.28 seconds in the tactical race, won by Jamaica’s Tiffany James in 2:18.11 with her teammate Chantai Smith picking up silver .02 seconds ahead of Warner in 2:18.26. Warner and James—both 15 this year—will return next year in the Bahamas to battle for gold. With Tarika “Tinker Bell” Moses nursing a strained hamstring, Warner was inserted on the second leg of the 4x100m relay—combining with Jonel Lacey, Taylor Hill and Nelda Huggins—helping them to claim the bronze medal behind Jamaica and the Bahamas, after running 48.22 seconds, the first time a relay quartet to win a Carifta Games medal. It was Warner’s second bronze medal of the day and Huggins second of the meet adding to her 100m silver. Lacey—in her championships debut and her first season hurdling—dropped out of medal contention in the 300m Hurdles, when she hit the last barrier to place fifth in 45.97 seconds. Deya Erickson followed in 49.10. Niayla Smith who was spiked in her U20 Girls 800m race, finished ninth in 2:25.86. Under 17 Girls Javelin Throw gold medalist Tynelle Gumbs, had a personal best toss of 30.66m in the 1.0kg Discus Throw, to finish sixth. Aundre Turnbull equaled his U17 Boys High Jump best, when he cleared the bar at 1.75m and placed tenth. Heading into today’s final three events, Brandon Andrew is in fifth place in his Heptathlon debut. He was fourth overall in the 110m Hurdles, clearing the barriers in 15.93 seconds to earn 741 points. He finished in a three way tie for fourth in the Long Jump, after cutting the sand at 6.24m to earn 639 points. The 17 year old notched 444 points on the Javelin Throw, after the spear landed at 40.13m, to finish sixth. Andrew ended day one by finishing seventh overall in the 200m to garner 736 points for his fifth place overall tally of 2560 points. Tynelle Gumbs, U17 Girls Javelin Throw gold. 4x100m Relay (Jonel Lacey, Lakeisha “Mimi” Warner, Taylor Hill, Nelda Huggins) bronze. Today’s schedule: All times are Bermuda time, 1 hour ahead of Caribbean time.